The Zamberlan SH Crosser Plus GTX RR is a light-weight, mid-height boot offering great ankle support and a broad, stable sole. Within the category of light, mid-hikers, this Zamberlan boot excels in support and stability, feeling much like a heavy weight hiker, without the burden of the extra weight, weighing in at just two pounds, six ounces. Compared to other offerings in this category, this vegan boot from Zamberlan punches above its weight. Ankle padding is higher than most, if not all other mid-hikers out there. The mid-profile outsole is firm, and rigid, providing the type of solid base found in heavy weight boots. The midsole combines light weight with firm support. The combination of heavy, backpacking style construction with light-weight materials results in a versatile boot that can carry you through quick day hikes as well as longer multiple day backpack treks. The Zamberlan SH Crosser Plus GTX RR was a 2013 Backpacker magazine Editor’s Choice award winner. The fit of the Zamberlan Crosser Plus is much more like that of a backpacking boot, rather than that of other mid-hikers that tend to feel more like trail runners that are built up a bit. You feel the solid supportive base of the sole in every step. This firmer footing does sacrifice some of the softer foot feel that other, lighter mid-hikers offer. Sizing runs true to size, but if you know your European shoe size, you will find that a more accurate guide than the translation into U.S. sizing. The outsole of the Zamberlan is provided by Vibram: a trusted and reliable maker of hiking and work boot outsoles since the dawn of time. 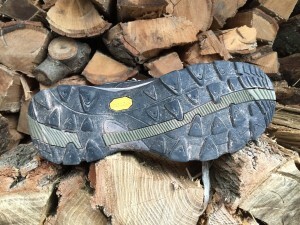 The outsole of this boot consists mostly of Vibram’s Speed Hiking rubber compound. Expect it to wear very well, be resistant to cuts or gouges from rocks and be pretty sticky on a variety of surfaces. 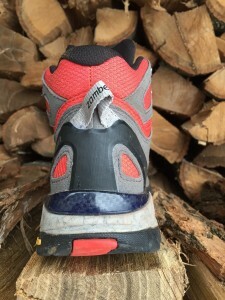 The sole has a series of breaking lugs at both the toe and heel. These work well. I found the breaking lugs at the heel to be very effective, resulting in sure footed descents. The heel portion of the sole is wider than that on other boots of similar weight. I found the wide heel provides exceptional stability, again most noticeable on descents. My wife, Jen, also has a pair of these Zamberlans. When she first switched to these boots, the heels got in the way a bit, as they are wider than most. After a couple hikes, she was used to them and is now a fan of their supportive platform. The laces of the Zamberlans have a traditional hiking boot look and feel. Yet, when paired with a very robust heel cup and the flexible Goretex fabric of the last, the result is a comfortable, secure feeling. A most notable feature of the lacing is the eyelets. The eyelets are anchored back down to the footbed through a series of TPU reinforcements. This should prove a durable feature in the long haul. On the performance level this helps add to the secure feel of the boots. The TPU, along with the lacing, secure the foot to the foot bed. The last is made primarily of the highly regarded Gore-Tex fabric. This give the boot breathability and great water resistance in a forgiving, comfortable upper. 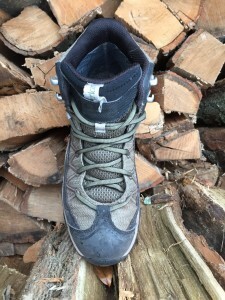 Again harkening to this boot’s connection to heavier backpacking boots, the last of the Zamberlans offers a lot of robust protective additions. The entire outer edge of the last, from the sole extending up about an inch, is reinforced with a layer of Cordura nylon. This protects both the feet and the boots from rock scuffs. The toe and heel are well armored. Both ends of the boot feature multiple layers of resilient protection from synthetic materials including TPU and Kevlar. 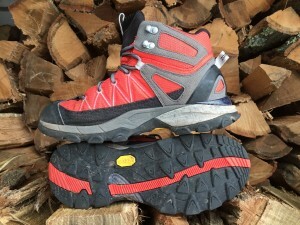 This is a light-weight mid-hiker that performs and protects much like a much heavier boot. It is comfortable and light enough for day hikes, while offering the security, support and firm foundation needed for long backpack treks. The day I knew I was to fulfill a volunteer commitment to haul about a gazillion gallons of water up a mountain to aid the runners of the Manitou’s Revenge Ultramarathon, I opted for these boots. If you need just one boot to cover the broadest possible range of hiking adventures, the Zamberlan SH Crosser Plus GTX RR is an excellent choice. Find the Zamberlan SH Crosser Plus GTX in women’s and men’s. Jim Van Alstine lives and hikes primarily in the Catskill Mountains and calls the Devil’s Path his back yard. He, along with his wife, Jen and rescued dogs Pasha and Vincent, hike every weekend through three season and usually manage a couple backpacking trips to the Adirondacks High Peaks region each year. Jim also lived in Colorado for many years and summited a number of Fourteeners. 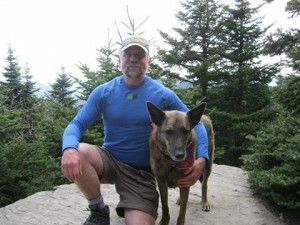 Jim’s adventures have been fueled by a plant-based diet since 1988, vegan since 2002. When not out on the trails, Jim is master compounder for Woodstock Herbal Products, which manufactures a certified-vegan line of traditionally handcrafted herbal tinctures. Enter your email to be the first to know when new gear reviews are posted!